The meeting will take place in the Consejo Superior de Investigaciones Científicas (CSIC) Central Campus. The Central Building of the CSIC Central Campus (see picture) is located at Serrano 117. The location of the Conference Building will be specified at a later stage. 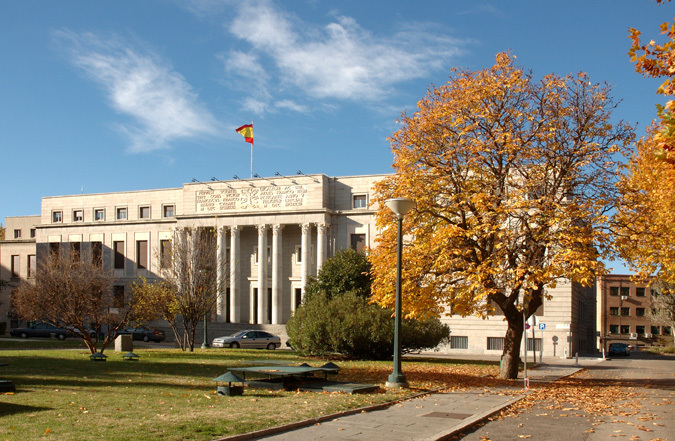 CSIC Central Campus is located in one of the most important and commercial streets of Madrid (Serrano), in the Embassies' quarter, not far from the downtown, ten minutes walking from the Paseo de la Castellana, 30 minutes by Metro from Puerta del Sol (downtown centre) and half an hour by taxi from Madrid-Barajas airport. CSIC Central campus can be conveniently reached by Subway Line 6 (GRAY LINE), "Republica Argentina" station (exit "Joaquín Costa, pares), as depicted in the map below. Madrid-Barajas airport has four terminals. As described in the homepage of the airport, all terminals are conveniently connected to the Metro Subway Line 8 (PINK LINE), which ends up in "Nuevos Ministerios", 10 min. 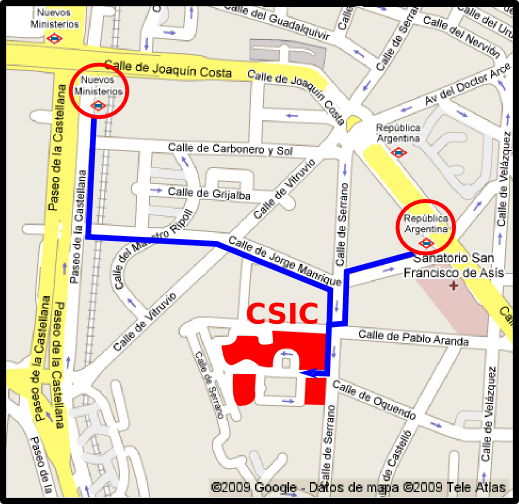 walk from the CSIC Central Campus (see the map below). You can download the Map of the Subway Network in pdf format here. Several bus lines run from the Madrid-Barajas airport to downtown Madrid (click here). For example, you can use the EMT Airport Express Service 24h to/from "Plaza de Cilbeles". Taxis are also available at Madrid-Barajas airport (about half an hour to CSIC Central Campus and a fixed rate of 30 euros).